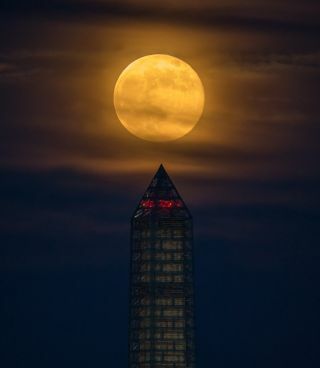 A supermoon climbed its way to the top of the Washington Monument, Sunday, June 23, 2013, in Washington. This year the supermoon is up to 13.5 percent larger and 30 percent brighter than a typical full moon is. This is a result of the moon reaching its perigee — the closest that it gets to the Earth during the course of its orbit. During perigee on June 23 the Moon was about 221,824 miles away, as compared to the 252,581 miles away that it is at its furthest distance from the Earth (apogee). July's full moon may not technically be "super," but it is still a sight to see. The full moon on Monday (July 22) is not considered a "supermoon" — the full moon that occurs each year when the moon is closest to Earth — although the moon is still quite close to the planet. This year's supermoon fell in June, but the two full moons in the months which flank a supermoon are almost supermoons as well. Monday's full moon will occur at 2:16 p.m. EDT (1816 GMT), so Americans will not get to see the exact moment it's full. Technically, folks in the eastern half of the country didn't really see the supermoon last month because it set just before it was exactly full. At moonrise around 8:17 p.m. EDT (0017 July 23 GMT) on Monday evening (about 6 hours past full) the nearly full moon will be only 223,258 miles (359,299 km) away — or 1,434 miles (2,308 km) farther than the supermoon at its closest distance. However, if you check out the nearly full moon at the stroke of midnight on the east coast of the United States on Sunday night or Monday morning, it will be only 222,758 miles (358,494 km) away — just 934 miles (1,503 km) farther away than the June supermoon, roughly the distance from Atlanta to Boston. Now that the ballyhoo concerning last month's supermoon has subsided, I feel that I should correct a couple of points that were being bandied about by the mainstream media. Point 1: "The Super Moon appeared 14 percent larger than normal." Assuming that "normal" refers to the moon's mean distance from the Earth of 238,855 miles, the supermoon actually appeared 7.1 percent larger than normal, not 14 percent. Perhaps most media outlets got it wrong in that the 14 percent really referred to the difference between the moon's closest point to Earth (perigee) versus its farthest point (apogee). The absolute closest that the moon can come to Earth is 221,439 miles and the absolute farthest distance is 252,724 miles. But that's a difference amounts to 12.38 percent; again, not 14 percent. There were also a lot of images published on the Internet in advance of the June supermoon depicting exceedingly large full moons implying that the moon was going to look amazingly large in the sky. But unless you caught the moon when it was either rising or setting — and appearing briefly larger than normal because of the "moon illusion" — June's full moon looked pretty much like any other full moon. Again, this was an incorrect statement. While the full moon's distance from Earth is one factor in determining its brightness, an even more important factor is the sun. When the Earth is near perihelion (the closest point to the sun), the moon receives more sunlight than under average circumstances. Conversely, when the Earth is near aphelion (farthest point from the sun) the moon receives less sunlight than average. Aphelion occurred less than two weeks after the June "supermoon." The moon's perigee distance from Earth was 221,824 miles (356,991 km). Let's suppose that a person saw the moon directly overhead, yielding a distance from the Earth's surface to the moon's center of only 217,861 miles (350,613 km). The Earth's distance to the sun at that same time was 1.016 astronomical unit (one astronomical unit is the Earth's mean distance from the sun). More likely the media again got their semantics wrong. They meant to say that the supermoon was 30 percent brighter than when the moon is at apogee (farthest from the Earth). But was that 30 percent value valid? The full moon of Jan. 16, 2014 will be at apogee; so how much brighter is June's full moon compared to next January? I did the calculation and found that it was 25.9 percent brighter. Not quite 30 percent. That, incidentally, corresponds to a ridiculously small increase of just 0.25 of a magnitude. And yet, a friend of mine told me that she was expecting the June supermoon to look radically brighter: "Like with those 3-way light bulbs," she said. "I thought it was going to be like turning the moonlight up a notch." I wouldn't be surprised if that was what many were expecting to see last month. But so far, as full moons are concerned, an increase of 0.25 magnitude is hardly perceptible to the eye if at all. So again, we had a full moon that did not really look much different compared to other full moons. The term supermoon is not astronomical, but originated in modern astrology. It was first used by astrologer Richard Nolle in 1979, who arbitrarily defined it as "… a new or full moon which occurs with the Moon at or near (within 90 percent of) its closest approach to Earth in a given orbit (perigee)." Even though the term supermoon was created over 30 years ago, it didn't really catch on until March of 2011 when the full moon arrived at an exceptionally close perigee distance, coming within 126 miles (203 km) of its closest possible approach to Earth. Suddenly, the term went viral. Now, it appears that it will be used every time a full moon coincides with perigee. On average, the moon becomes full within a few hours of perigee about once a year. The next time this will happen will be on Aug. 10, 2014. Maybe the supermoon moniker shouldn't be used so often. For the moon to be truly super a super, maybe it needs to come exceptionally close, as it did in March 2011. How close? Why not define it as within 0.001 percent of its closest possible approach? That's 221,439 to 221,660 miles (356,372 to 356,727 km). Using this criterion, last month's full moon would not have been ranked as a supermoon and neither will the full moon in August 2014. In fact, the next supermoon would not come until Nov. 14, 2016 when the full moon will be 221,524 miles (356,508 km) away or within a 85 miles (137 km) of its closest possible approach. Visually, you probably won't notice anything unusual about that moon in 2016 either, but if you you're looking for a full moon that's truly going to be close, mark your calendars. Editor's note: This article was updated July 22 at 2:20 p.m. to correct the conversion of miles into kilometers. If you have an amazing night sky photo of any celestial sight that you'd like to share for a possible story or image gallery, please contact SPACE.com Managing Editor Tariq Malik at spacephotos@space.com.